This video is for real estate agents, investors and anyone else trying to sell real estate. You’re about to learn how to avoid, and overcome one of the most common pitfalls in real estate offer evaluation, obsession with the sales price. So take a look and let me know what your thoughts are in the comments box below! This video was great and full of information that is very useful. I like it very much. Also can u explain the difference between offer points verses cash on a purchase or sell. When you say “offer points” are you referring to buying points on a mortgage, or something else? I got your video and found it interesting and informative. I have also been reading your newsletters sent to my email, I want to have more so I hope you will continue sending them. More is on the way! Thanks for your support. I really like the idea of weekly tips! 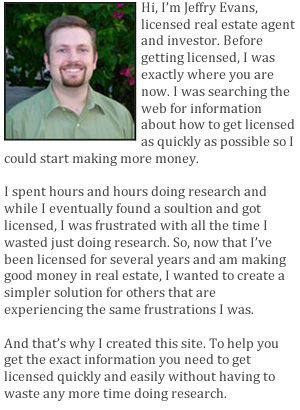 I am in the process of doing my research on the business of real estate before getting my license. I really want to be prepared when the time comes to jump into the business (after I get my license). Weekly tips are something very useful for me. Do you have any tips for my personal situation? Yes, I have plenty of tips that can help your situation. If you haven’t already looked at them, go here and get signed up for my free 12 step program for starting a traffic getting real estate website. About 80% or more home buyers begin their search for a property online, so this program will walk you through getting setup for your real estate internet website, and you can do it now, even before you have your license!